These cupcakes are amazingly moist and soft! The filling tastes just like a Reese’s Cup! 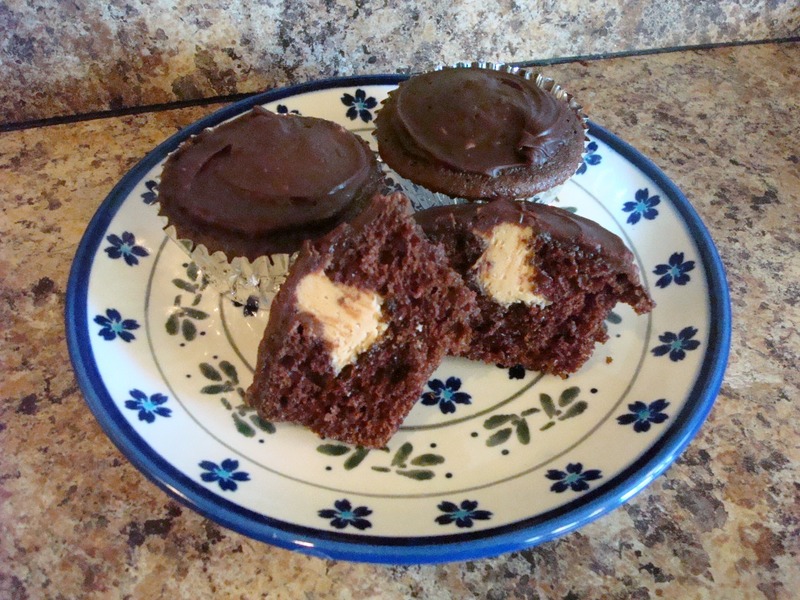 If you are a peanut butter and chocolate combo freak, these cupcakes are the perfect solution to ease your cravings! The recipe calls for a ganache frosting but I was in a hurry when I made these, so I just frosted them with regular chocolate frosting and they were still super-awesome! Happy baking…and happy eating! In a large bowl, beat the butter and sugar until crumbly, about 2 minutes. Add eggs, one at a time, beating well after each addition. Beat in vanilla. Combine flour, cocoa, baking soda, salt and baking power; add to creamed mixture alternately with buttermilk and coffee just until combined. Fill paper-lined muffin cups half full. Bake at 325 degrees for 15-20 minutes or until a toothpick comes out clean. Cool for 10 minutes, remove from pans to wire racks to cool completely. For filling, in a small bowl, beat peanut butter and butter until fluffy. Gradually add confectioners’ sugar; beat until smooth. Cut a small hole in the corner of a pastry bag or plastic bag; instert a small tip. Add filling to bag. Push the tip through the top of the cupcake to fill each cupcake. For ganache, in a heavy saucepan, melt the chocolate with cream over low heat; stir until smooth. Remove from heat. Cool for 10 minutes or until slightly thickened.